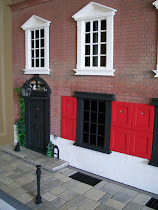 The Tenement: Burns' Supper - Chez Moi! 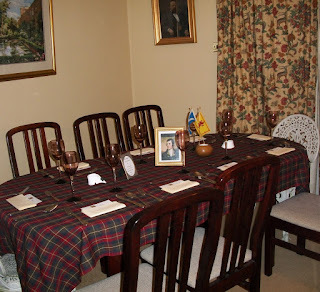 Burns' Supper - Chez Moi! Not a mini post this time but a RL event. Friday, the 25th January was Burns' Night. The night on which Burns' birth date is celebrated. 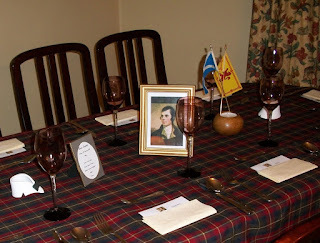 I don't do this every year but decided as it wasn't a school night I'd host a Burns' Supper. This is my little tribute to Burns complete with a photograph of the Bard, printed menu and place cards. My own plans for a Burn's Supper were derailed by Small Dog's travails. Still.... there's always next year. It's a Wonderful Land to have a Poet for a National Hero!!! It all looks wonderful! Questo è proprio quello che mi piace! Vedere e belle tradizioni popolari che contraddistinguono un popolo e arricchiscono gli altri con la loro cultura. Grazie per aver condiviso anche solo queste poche foto della tua RL, come dici tu! It's lovely, Irene! My grandfather was a professional Scottish entertainer à la Harry Lauder, and I attended many large Burns Day events as a child. I far prefer the intimate Burns' Supper at home -- it's warm, friendly and a real celebration of the man and his work. These traditions make me love the Scots, in a particular way. Nice idea to celebrate the poets birthday. A Burns supper. I tried to read the menu and couldnt dang, lol... Glad a good time was had by all. Your table looks wonderful Irene. I love the tartan tablecloth. This poem by Burns has a special place in my heart, it was the poem that Holden Caulfield of "Catcher in the Rye" fame miss quoted, it was a moment in the book that bought a tear to my eye. Your table looks fabulous and hope you enjoyed your celebrations, thanks for sharing Irene! I'm so pleased you all liked my little tribute to Burns and Paula, there's a reason why there aren't any "after" pics! To quote Flora, we were all "enthusiastic celebrants" - lol! What a grand time you must have had! It must have been a great evening! Lovely table. i am sure a great time was had by all. Hi Irene! I was excited to see that you had celebrated Burns Night! I've purchased Pippa Middleton's book "Celebrate". Burns Night is explained along with a menu, crafts, and games. The menu looks delicious! You must have all had a fantastic time. Hi Irene, still trying to catch up as you can see! Hope you had a great Burn's Night Supper, who did you get to pipe in your haggis?